Just a couple weeks ago, we hit our minimum spend on the first travel rewards card I opened up several months ago. I opened a Chase Sapphire Preferred® Card up in my name, spent a little over $4,000 in 3 months … and will eventually rack up over 64,000 Ultimate Rewards® points. All of our $4,000 in spending was on normal expenses that we would have made regardless of opening this card. Instead of paying cash for food, cell phone bills, utility’s, etc. we took advantage of travel rewards to optimize our spending. By hitting our minimum spend on this card ($4,000) within the first 3 months, we will earn 50,000 bonus points (out of the 64,000 total). Those bonus points earned is where these travel rewards cards can be useful. So in order to earn even more bonus points and maximize our monthly spending, my wife opened up the same card about a month ago and is now close to hitting her monthly spending. By the way … we are planning to build up our portfolio of travel rewards to take a FREE trip to Hawaii in a couple of years for our family. This is a vacation that both my wife and I have always dreamed about but never wanted to pay for. Earning travel rewards will help us one day cross this off our bucket list. If you want to follow along on our journey, please visit our Travel Rewards page which will have all relevant articles and updates on our progress. In the meantime, I wanted to talk today about an important life hack we are using to hit our minimum spend on my wife’s card. Recently we paid several hundred dollars in dental expenses (most of which will be reimbursed from our dental insurance) in order to help with our spending. One life hack we recently found to help hit our minimum spend quicker is using our travel rewards card to help pay for dental expenses. We have dental insurance through my employer and compared to our medical insurance … is actually not too bad. Unlike our medical insurance though, any dental work we have done is paid at the time of the appointment out of pocket … which includes cleanings. Our dentist then submits a claim to our insurance provider for the reimbursement. For basic dental work, our insurance usually covers around 90% of the cost. So just a few weeks ago, my wife took our 3 kids to the dentist for their 6-month cleaning. She paid $636 out of pocket at the time of the appointment … all on her travel rewards card. Then a few weeks later, we received a reimbursement check for a total of $586. After depositing the reimbursement checks, we immediately paid down the $586 on her credit card balance. Despite paying for $50 worth of our dental expenses, we were able to add $636 worth of spending to her $4,000 of minimum spend and pay back 90% of these costs before they were even billed to us. For years I would get stressed anytime we had to pay out of pocket for dental work. However, since finding travel rewards … I welcome this hack as a way to help accelerate the points that we can eventually earn. In less than 2 months, my wife will have hit her minimum spend on our second travel rewards card … which should bring in another 54,000+ Ultimate Rewards® points. By paying for our recent dental expenses (that are mostly reimbursable) on a travel rewards card, we have been able to open up our 3rd card … the Chase Ink Business PreferredSM Card in my name. This latest card has a higher minimum spend requirement of $5,000 in the first 3 months. So before we opened the card, we needed to make sure we could balance finishing the spending on my wife’s Chase Sapphire Preferred® Card with the new spending requirements on the Chase Ink Business PreferredSM Card. Paying for our kids dental visit has given us the confidence of opening up our 3rd card. The good news (or bad news depending on how you look at it) is that our property tax bill is due on our home by the end of the year. So not only have we optimized our spending on the second card by paying for dental expenses, we have also strategically timed the opening of our 3rd card to pay for our property taxes … knowing card #2 is in good shape. 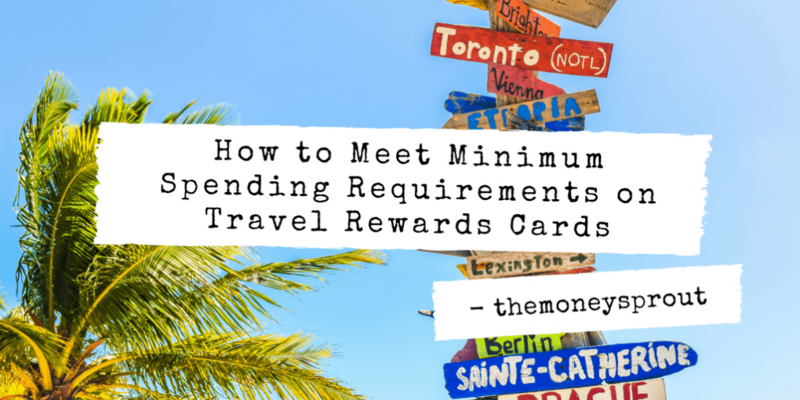 As we continue down the road of building our travel rewards portfolio … we have realized that hitting minimum spend requirements isn’t too difficult if you are flexible and smart. For example, using large one-time expenses like visits to the dentist and paying for property taxes will help us finish up our spending requirements on cards #2 & #3 by the end of January. Considering we opened our first card back at the end of August, we will have built a portfolio of close to 200,000 Ultimate Rewards® points in 5 months. Planning ahead, we will likely only finish off 2 additional cards in the remaining 7 months of the first year … because we won’t have as many big one-time expenses. We are still learning new hacks all the time about building up a travel rewards portfolio. One of the most useful we have found so far is timing one-time expenses that can help pay down hundreds or even thousands of dollars in one quick payment. Dental expenses and property taxes are just 2 recent examples of that. Note – We have always paid off the full balance on our credit cards at the end of every statement … so that we don’t take on any extra fee’s or interest. If you are considering building a travel rewards portfolio, it is critical you continue to live within (or preferably below) your means. Paying credit card late fee’s and interest will quickly cancel out any benefits you may get from earning travel rewards.